OGx understands that the most important answers to your complex business challenges may be hiding in your data. Our Analytics services can help you transform your data into actionable outcomes enabling you to gain a competitive advantage in forecasting, planning, regulatory compliance, and business performance. We offer an integrated approach to information management services and a broad range of capabilities. OGx has built a structured approach to information management best practices that can help your organization become more analytical and data-driven. We provide everything from specific expertise on discrete issues to holistic transformations spanning strategy design, build, implementation, capability building, and ongoing support. Along with our proven processes, tools, and experience, we can assist you in maximizing the value of data assets throughout your enterprise. Organizations that view information management as a strategic imperative reap the benefits of operational cost reduction, increased revenue, and reduced regulatory risks. To ensure that we deliver exceptional value, we leverage proven analytics methodologies, best practices, and tools to define the right analytical solutions for you to solve complex business challenges and resulting in the elevation of your organizational performance. Data Governance and Management: We help you build the capabilities needed to support long-term strategy on master data quality and provide the foundation required to address the business issues relating to master data quality. Analytics Maturity Assessment: We help you understand their current analytics maturity, and provides a comprehensive data and analytics roadmap to build a data-driven organization and culture. Advance Analytics: We incorporate data science, machine learning, data mining, forecasting, and simulations to offer predictive capabilities to clients. Data Engineering: We focus on gathering and combining data from disparate sources and building data assets to facilitate analytics that supports decision making. 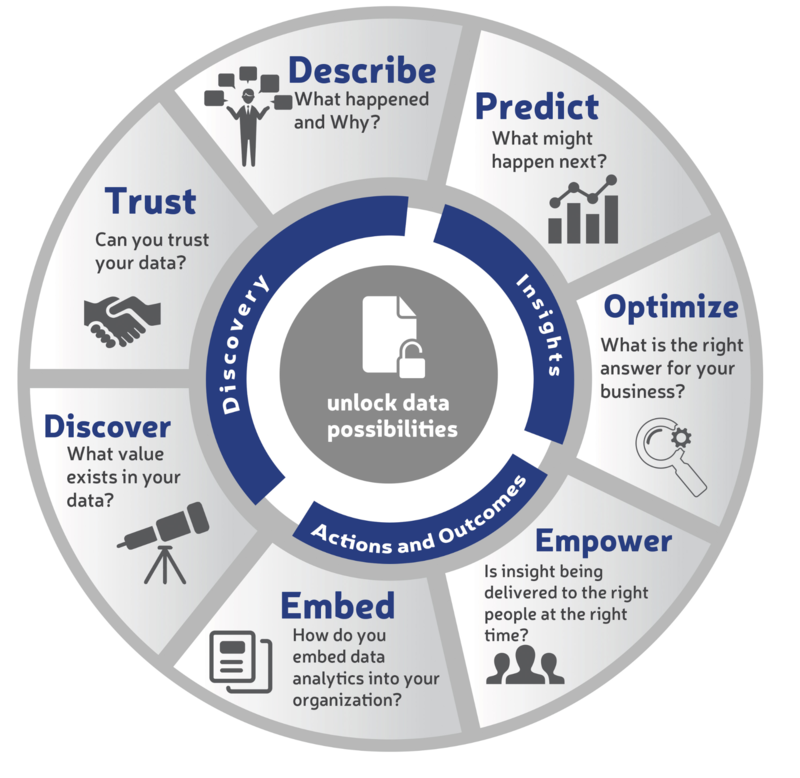 Business Intelligence: We empower our clients to quickly discover and gain insights from their business data. Our key offerings includes; Ad-hoc and Insightful Reporting, Intelligent Dashboards, Data Visualization, OLAP Cube Design and Implementation.